Turn your love of horses into your career with the Bachelor of Equine Science (with specialisation) from Charles Sturt University – one of only two Bachelor of Equine Science degrees in Australia. This course will prepare you for a successful career in equine or animal health, welfare, breeding, training, nutrition, performance, rehabilitation, teaching, research or business. A business management specialisation, as well as a choice of elective subjects, will equip you with the skills and knowledge you’ll need to make evidence-based decisions in equine and animal-related industries, ensuring you’ll be job-ready when you graduate. Delivered by internationally recognised academics, the Bachelor of Equine Science (with specialisation) is a practical and contemporary program. A choice of electives gives you the ability to contextualise and pursue your specific interests and career aspirations. As well as acquiring a fundamental understanding and appreciation of anatomy, physiology and the basic sciences, you’ll develop skills in equine nutrition, reproduction, training and performance, health and welfare, and business. If you choose the business management specialisation, you’ll also study financial management, business law, human resources, property planning, advertising and marketing. Charles Sturt University offers world-leading technology and facilities, including a high-speed treadmill and reproduction barn and laboratory. The Equine Centre has six stable blocks, covered yards and handling facilities, an indoor arena, several outdoor arenas and an undercover horse walker. If you wish to bring your horse with you, we offer stables with access to communal paddocks. You provide your own feed and bedding and care for your own horse as a boarder. Local feed suppliers will deliver to Charles Sturt University. We ensure low staff-to-student ratios, so you receive individual help and support throughout the course. You can also choose to study online to complement work and lifestyle commitments. While there are no prerequisite subjects, studies in mathematics and chemistry at Year 12 level are preferred. Prior horse experience offers some advantages but is not essential. You do not need to be able to ride a horse to complete the degree. Instruction in riding is not offered as part of the course. If you achieve a grade point average of 5.0 or above, you‘ll be eligible to enrol in a one-year Honours program to develop the skills necessary for a career in academia, teaching and research. 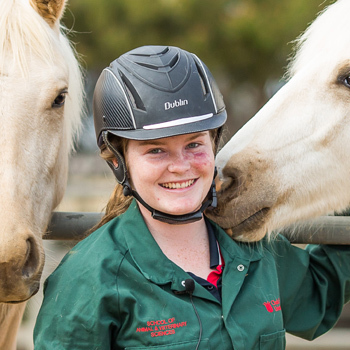 With a multitude of professional opportunities available across the growing equine industry, you're building a lifelong career when you study the Bachelor of Equine Science at Charles Sturt University. You'll be prepared to positively impact the management, health, welfare, reproduction, nutrition, training and performance of horses kept in traditional and contemporary systems. Use your business management skills to pursue employment opportunities in an animal-related business, or even start your own. With the equine sector contributing $6.4 billion to the Australian economy annually, career and business pathways will continue to develop for those best equipped to capitalise on the opportunities. Take your specialised skills in equine science to a variety of industry roles, such as equine management, welfare, rehabilitation, training and performance. Put your business skills to work in roles in government, sports administration, media or teaching and coaching. "The staff provide really interesting and relevant content, and are all very approachable. They respond really quickly when I email with a question, and the enthusiasm with which they teach makes all of the topics interesting!"